Living as part of the land, enjoying the space, peace and quiet and beautiful living in the home of your dreams—that’s what luxury acreage home design is all about. Our bespoke rural house designs are designed to fulfil your requirements and to reflect the special environment you’ve chosen as your new home. We listen to your needs and dreams to create an architectural vision that will truly embrace who you are and encapsulate your lifestyle. Luxury acreage home designs are all about giving you and your family the space needed to live as one with your environment. Acreage blocks of land inspire generous, free-ranging expression in house design without the limitations of suburban sites. The contours of the land offer visual clues that suggest a myriad range of form and function possibilities for your new home. Wide open spaces, beautiful peaceful vistas, tranquil bush and forest areas, river, sea and water features all inspire an organic response to house design. The result: a home for living where inside and outside meets in a perfect blend of natural materials, practical functionality, and inspirational beauty. We work with you and the land to capture the essence of a peaceful setting throughout with open plan spaces that embrace the surrounds and flow seamlessly into the exterior environment. Our luxury house designs match your daily lifestyle needs and complement the peaceful serenity and privacy of the land. Whether your land features level sites, rolling hills or the side of an escarpment, the land opens up exciting possibilities for house design. Our team will assist you in choosing the right location and orientation for your dwelling. Every one of our designs is completely unique and individually tailored to each client’s needs. We pride ourselves on coming up with exciting, fresh designs every time. No two rural house sites are the same. Each site offers fresh possibilities for exciting solutions, and every client is seeking a truly special expression of their personalities and aspirations. Custom house design is also about practical ease of living. Innovative design features incorporate natural lighting, ventilation, and energy saving thermal mass storage to enhance the comfort of living with the changing seasons. We design custom homes that work with the land and your day to day needs. This means that we can incorporate other buildings or structures on site as part of an overall cohesive organic design. 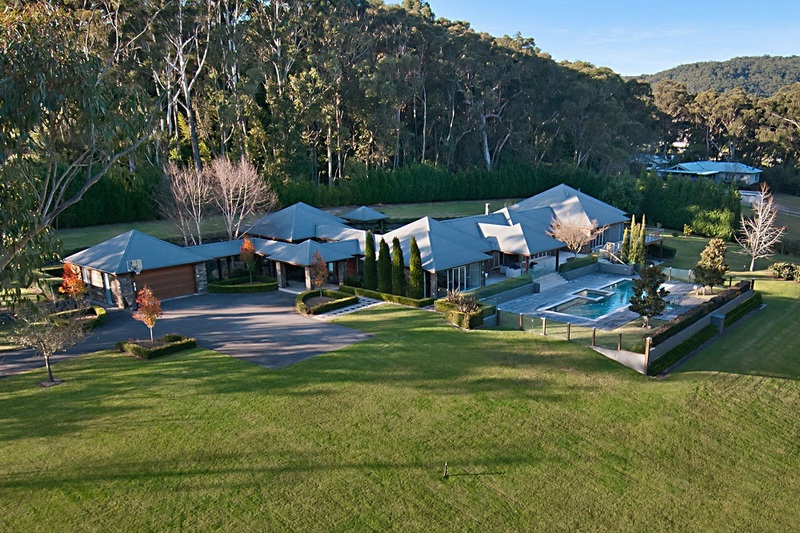 This might include swimming pools, cabanas, machinery or equestrian sheds and even secondary accommodation. Inspiration for our modern acreage houses comes from the great architects of the early 20th century. Architects such as Frank Lloyd Wright and Ludwig Mies van der Rohe changed the way homes were designed to suit the modern family. We continue with their free-flowing, naturalistic ethos in our designs. Precision planning combines symmetry and balance with a luxurious sense of space and subtle detailing. The result: a warm ambiance of opulence supported by solid functionality and usability. Extensive outdoor entertaining areas also enhance this beautiful life you’ve worked hard to deserve. Every one of our house designs is different and unique. 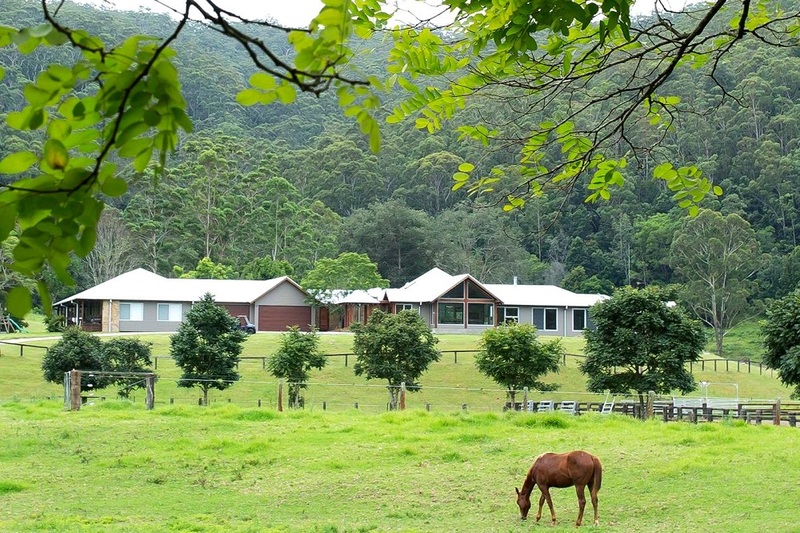 We create bespoke luxury homes with our inspiration coming from the land. Our home designs reflect the landscape in a very organic way: siting the house according to the land contours to capture and frame the valley, mountain, bush or water views. We believe in timeless designs that will grow in beauty. 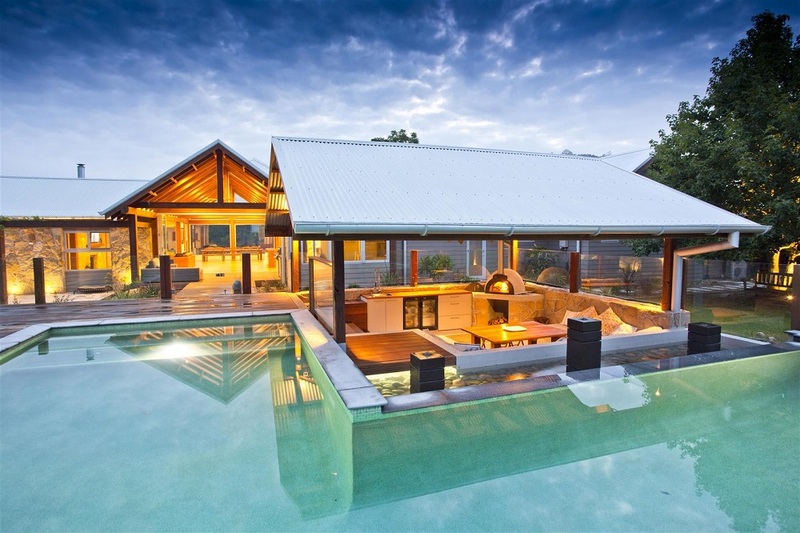 Open plan home designs incorporate natural elements of stone and timber and large expanses of glass to create light filled rooms that enhance your interactions with the beauty and serenity of the outside space. The warmth and strong lines of solid timber beams create a sense of spaciousness and frame panoramic views through floor to ceiling glazing. The intricate patterns inherent in wood grain and stone mirror the exquisite details of the natural world at its finest. Each room takes advantage of the vast resources of natural lighting, fresh air ventilation, and passive solar design. The selected material palette is composed of locally sourced sandstone and timber wherever possible. We’ll create beautiful outdoor living areas and courtyards so that you feel a real living connection with the features you love about your land, whether it’s a water feature, a single specimen tree or the spectacular view. The option to open up your living areas completely to the outside world with full width sliding or folding doors adds a special touch. 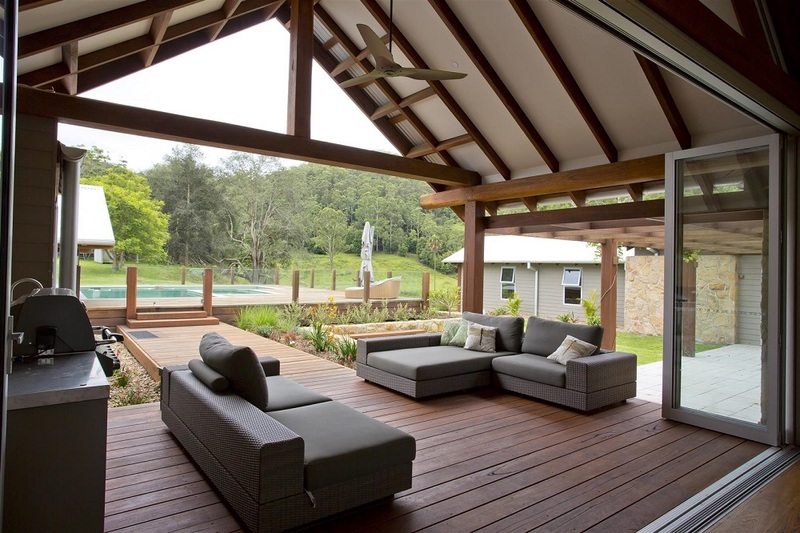 We favour oversized eaves and wide pergola areas to provide relief and protection from the weather. 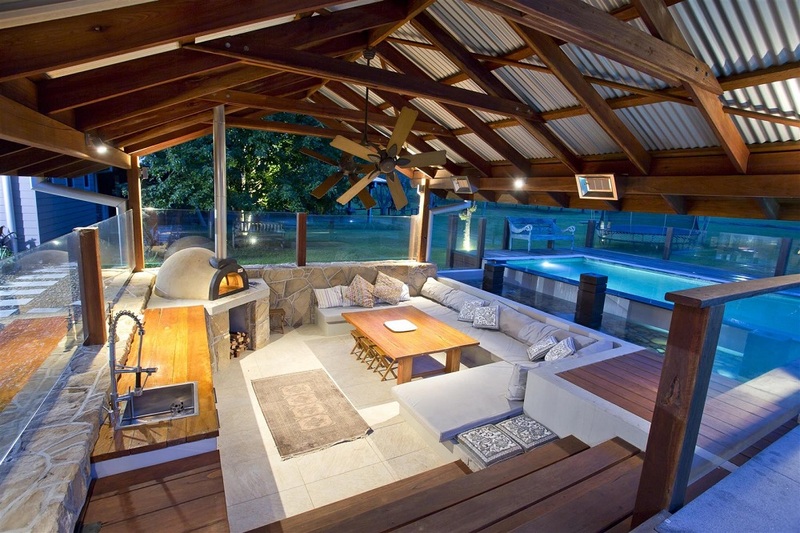 Features such as pool side sunken Pizza Pits provide the ultimate entertaining spot whatever the weather. We often have said that the home is like living in a resort. With finishing touches such as waterfall edged swimming pools or full sized bowling lanes our luxury homes can be as ostentatious or as subtle as you wish. And with flowing open plan living, kitchen and dining areas you’ll feel like you’re permanently on holiday in the most luxurious resort imaginable. 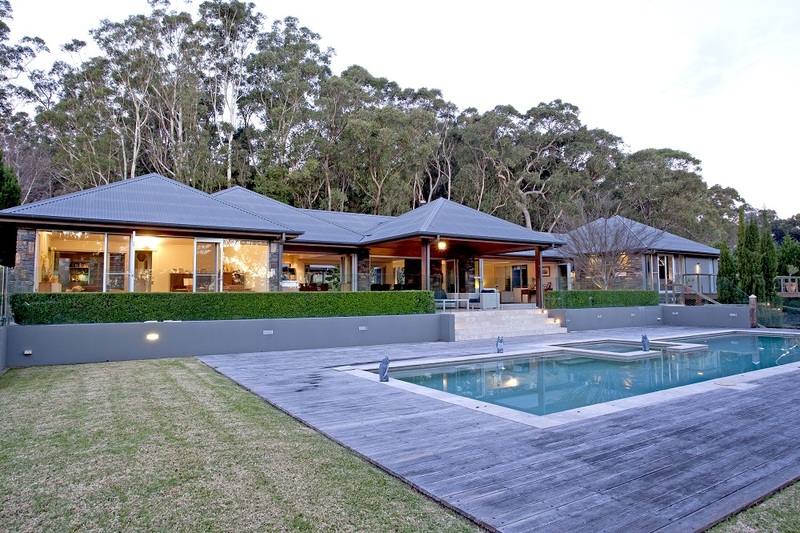 We design stunning bespoke luxury homes throughout rural Sydney, Central Coast, Hunter Valley, Southern Highlands, the regional NSW and Queensland. Each area has its own unique beauty and we can work with you to design a stunning personalized rural home that takes advantage of all the special aspects of your location. We take the time to listen to your vision, understand the special features of your site and to craft the perfect response for your luxury acreage home design. We’ll make the process of designing and building your luxury acreage home an exciting journey of discovery. 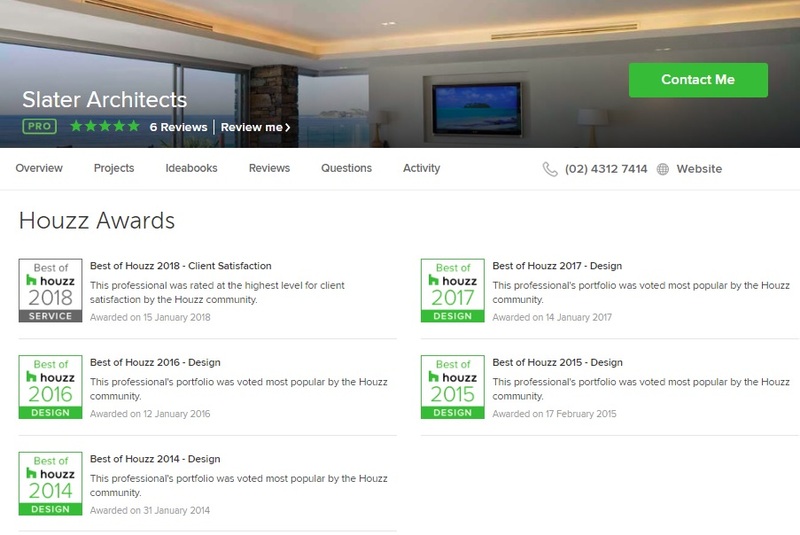 Our work has been recognised and honoured with awards from the Australian Institute of Architects (AIA), the Best of Houzz awards for 2014, 2015, and 2016, 2017, 2018 and has featured in numerous well known architectural publications and magazines.